A lot of B2Bs know social media is a valuable tool for web marketing, but don’t know how to make it work for them. I’ve heard marketers argue their customers aren’t there, but that’s usually not the case. Pew’s latest data shows 78 percent of American adults are on social networks – and the remainder are typically the ones who still don’t have internet access or smartphones. If the latter sounds like your customers, then you have a case for now. But if your audience IS connected, then chances are they’re on social media and looking for you. When one of our clients came to us looking to build brand awareness and drive more traffic to its website, we knew social media was part* of the answer. Before we could deliver on that solution, we had to figure out where this telecommunication company’s audience was active. Through some demographic research and social listening, we determined LinkedIn was the best choice for this company because it targets businesses and professionals that need connectivity solutions. *A social media marketing strategy is only as good as the content and distribution plan behind it. You need to have these other ingredients to be successful on any network. Check out this eBook for more details about how to build a strategy for your business. Daily custom social posts about mobile trends, online businesses, etc. Brafton’s team distributed updates on LinkedIn every day across these streams to create a strong and fresh presence on the network that would attract a qualified audience. It quickly became evident that LinkedIn was a fit for the company and its customers. The strategy was effective in generating more engagement and building brand awareness for the company. By interacting with other people on the network and sharing valuable content, the brand was building a notable presence that attracted the attention of interested readers. LinkedIn had become one of the site’s most valuable traffic sources, driving web browsers to the company to learn more about telecommunications solutions. 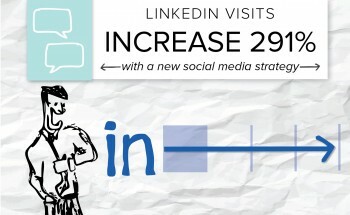 The high levels of engagement suggest readers coming from LinkedIn were actually interested in the information they found there. Generally speaking, the more people click around on a site, the higher the likelihood of a conversion as well. If someone is exposed to content and calls to action, there’s a better chance he or she will click one to learn about the company and what it offers. 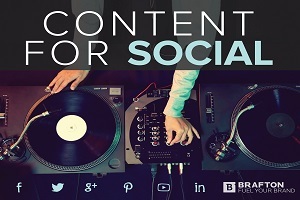 Any successful social media marketing strategy starts with goals and research. Social media is huge right now, but you won’t generate impressive results if you’re just going through the motions with the hope that something will catch. The next elemental piece of the puzzle is great content. Without something worth listening to, you won’t build an audience or give them a reason to engage with you further. This company is reaching its objectives of building brand awareness and generating site traffic because it appraised its target audience and used the insights gleaned as the foundation of its LinkedIn strategy. The hard work paid off in a new source of qualified visitors who are actively looking for information about its products and services.